Discover a magical universe where a unique magician awaits on The Pig Wizard Slot at Vegas Spins. It is made up of 5 reels and 20 paylines, created by Blueprint Gaming. Fly in the clouds and meet The Pig Wizard who can teach you a few magical tricks! The reels are set within a well-embellished frame, containing symbols like the Spell Book, Bags of Cash, Wizard’s Hat, Gold Coins, A, K, Q, J and 10. Launch this fantastic game on a desktop, mobile phone or tablet! On The Pig Wizard Slot, you can click on the + and – signs on the Total Bet field to adjust your bet. When it is done, press the Spin button. You can also click on “Auto Play” to launch several rounds that are played without any intervention. You can also stop this feature at any time during your gameplay. Amount of Paylines Selection: The 20 paylines remain active and cannot be adjusted. Coin Values: Select bet values ranging from £0.20 to £100.00. Trail Of Magic: Roll the dice across a board and collect cash prizes, as well as other rewards. The round ends when the dice stops on a Green Potion. Squeal Or No Squeal: Select one of the 10 spell books to uncover a cash prize. You can change it for another if you wish to earn more. However, you can do so only for a total of 5 times. Magic Mirror Free Spins: Receive free spins during which mystery mirrors randomly turn into matching symbols, offering potential wins. Progressive Jackpot: You can randomly trigger a Progressive Jackpot from the Magical Map Bonus Feature, after which one of the other games can be played. The Pig Wizard Icon on The Pig Wizard Slot is Wild and replaces any symbol to complete a winning combination, except for Bonus. The Pig is the Bonus symbol which helps to activate the main bonus round. 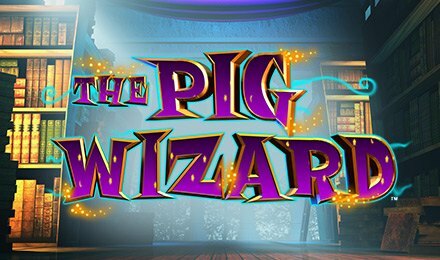 Experience some magic as you enjoy The Pig Wizard Slot at Vegas Spins. Make the most of this game and best of luck!